Built in 1964, the "real" Enterprise is an 11 foot, 3 1/2 inch long TV prop made of plastic, wood and metal which portrayed the Starfleet's finest ship on Star Trek. Considered an icon by the show's fans, it's the largest "miniature" ever constructed for a television show. When I started this modeling project in 1989, good references for the big model were few and far between and it would be a while before there would be such a thing as Internet Access. I wanted my finished model to more accurately resemble the real thing than the AMT kit built out of the box but researching the Enterprise turned out to be a challenge. 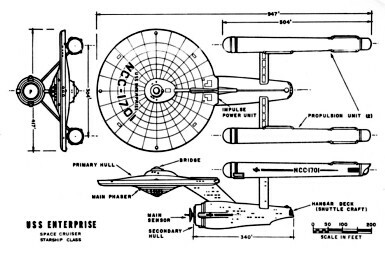 Most of the "blueprints" available, including those in Franz Joseph's popular STAR TREK BLUEPRINTS and STARFLEET TECHNICAL MANUAL are inaccurate. 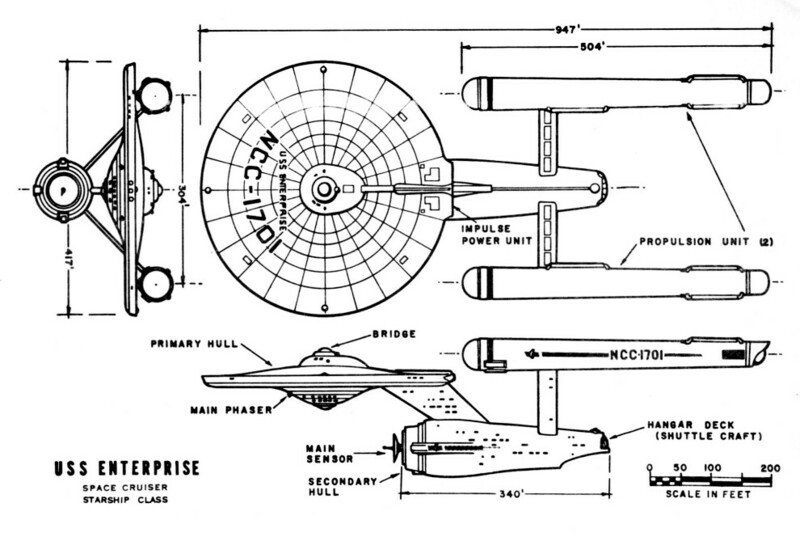 They appear to more closely resemble a drawing, left, which was published in 1968 in THE MAKING OF STAR TREK. A few years later, Ertl would put the same drawing on the side of the kit's box. For a drawing that more accurately depicts the contours and details of the big model, I found the "Bonhomme Richard class" starship U.S.S. 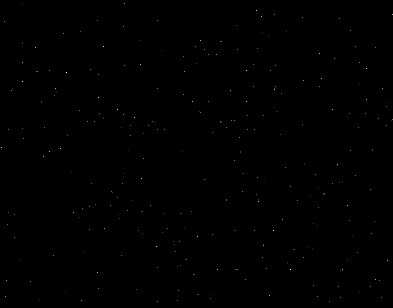 Essex (2257) in SHIPS of the STAR FLEET, Vol. 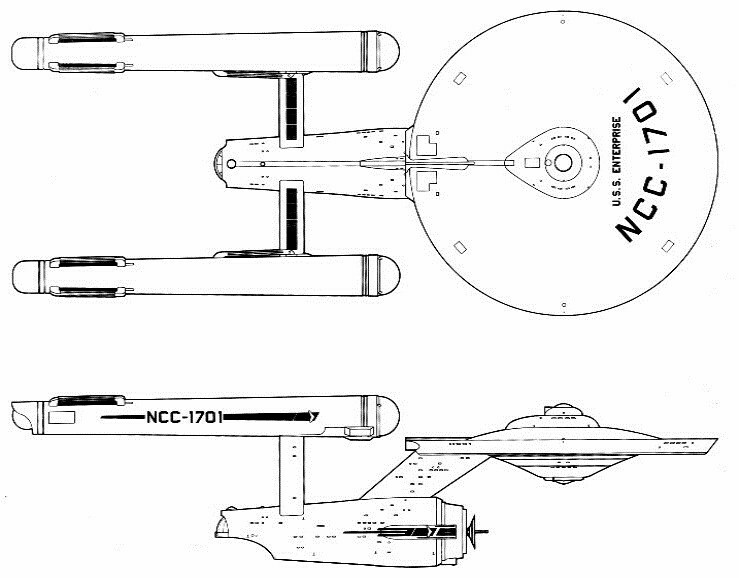 One, a fan-published listing of Star Trek era vessels. The image below is modified from that drawing. Reruns of Star Trek were not very useful references in the days of Standard Definition TV. 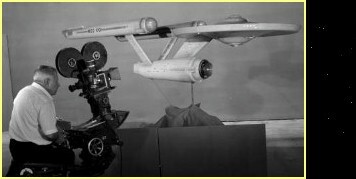 At the time, the best video prints of Star Trek episodes were available on a "newly mastered" set of VHS tapes and Laser Discs. Even when viewed on a quality TV, it was still tough to make out a lot of details on the ship. Kalmbach Books' FAMOUS SPACESHIPS OF FACT AND FANTASY AND HOW TO MODEL THEM has black and white pics of the big Enterprise taken during production of the show and after the Smithsonian acquired the model. There is also some interesting info about the big model and useful tips on building the AMT Enterprise, some of which were used for this project. The best available photos at the time were from a series of black and white publicity stills taken during the show's production that showed the big model in great detail against a starry background. Prints of these photos were rare but could sometimes be found at Star Trek conventions and fan shops with an 8 x 10 print usually selling for $65 or more. Copies of these pictures showed up in books like THE MAKING OF STAR TREK and FAMOUS SPACESHIPS but in both cases were printed very small and not of much use for model research. Naturally, the best resource would be the Enterprise, itself. 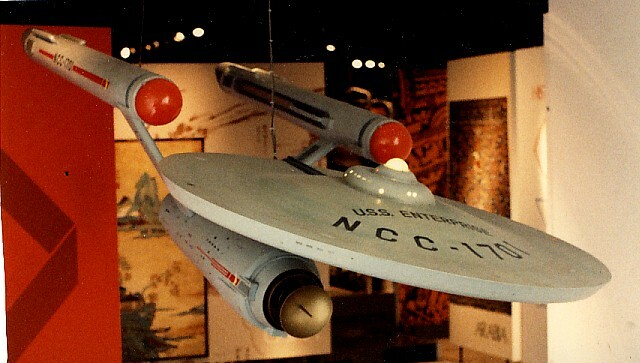 The Enterprise studio model can be seen at the Smithsonian Institution National Air and Space Museum in Washington, DC. In 1989, I paid the museum a visit. The big model was on display at the entrance to an exhibit about spaceflight in art, fiction and literature and was one of the more popular attractions at the museum. The model was hung from the Museum's ceiling about 15 feet off the floor in a narrow hallway. The strange location and position limited the views to either directly underneath or from a small platform on a nearby stairway in front of it. Sadly, the 25 year old Enterprise model was in poor condition. Some of the paint looked like it was wearing away and most of the lights were out. Replacements for parts that were damaged or missing when the Smithsonian acquired the model were inaccurate. The Enterprise looked less like the mighty starship seen on TV and more like the fragile, aging replica that it was. 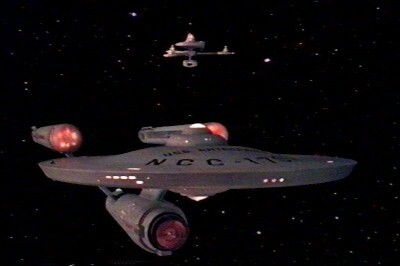 This was still a better look at the Enterprise than anything else that was available at the time. I must have taken over two dozen pictures of the big model and admittedly, having Trekkie tendencies, felt like I'd been photographing a major celebrity.